We have been bugging him for a while and eventually he had to succumb. We are very happy to announce that our man from San Michele di Ganzaria in Sicilia, Filippo Rizzo of Lamoresca, will be joining us in London in a couple of weeks time to introduce the new vintage of his wines at a couple of very special events. Filippo vines sit fair and square in the middle of nowhere, on a raised patch of rolling hills in Sicily’s interior, the only reference point being the smouldering peak of Etna peering over the hills. He farms around five hectares of vines up to fifty years old planted over a mix of sand and clay, with the rest of the farm dedicated to growing olives that produce some of the best olive oil we have ever tried. At an elevation of 430 metres above sea level, there are rather dramatic differences in temperature between day and night, allowing for freshness in this typically mediterranean climate. An articulate fellow, Filippo is wary of dogma and simply seeks to make the best wine that each vintage allows. For him these are wines made from fully ripe grapes that offer complexity, power and balance. 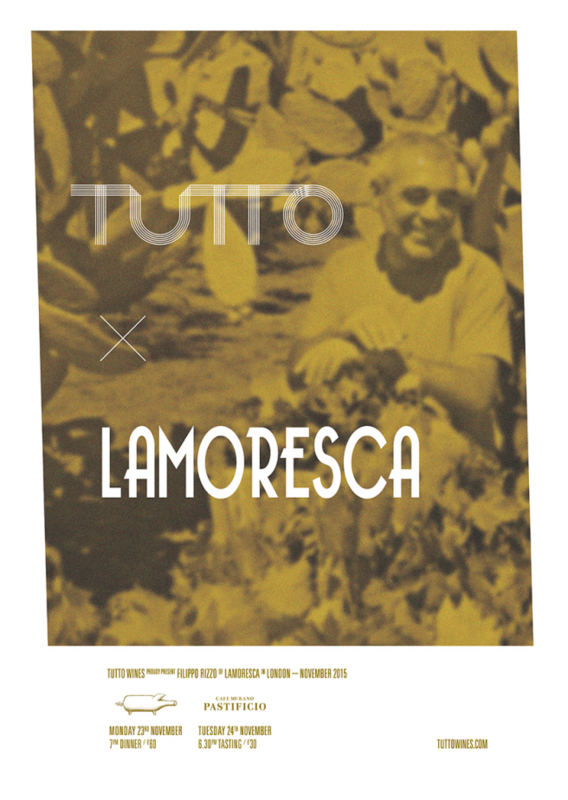 We hope you can join us to meet this wonderful man and try some of the most exciting wines being made in Sicily today. On Monday 23rd of November we are teaming up with the guys at Brawn for a night celebrating Filippo and his farm. We’ll be pouring all four of Filippo’s new releases from magnum while chef Ed Wilson will be cooking a menu which will take it’s cues from the island of Sicily and uses products from the Lamoresca farm, including the first of the year’s olive oil and the best passata you will ever try. The following evening on Tuesday 24th November Filippo will be hosting a masterclass at Cafe Murano Covent Garden’s Pastificio introducing guests to Sicily, it’s native grapes, Lamoresca and it’s wonderful wines. Over the course of the tasting, guests will enjoy a glass of each of Filippo’s four new releases along with a little cheese and salumi.